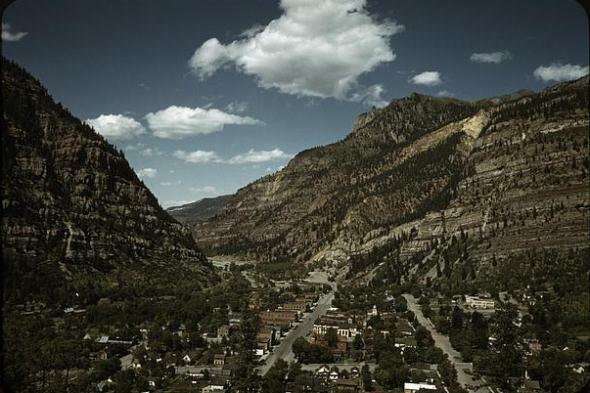 Ouray is surrounded by the San Juan Montains with the Million Dollar Highway in the distance. | Photo from 1940 by Russell Lee / federal Farm Security Administration. Ouray has long been known as “the Switzerland of America,” and the description is appropriate as you look up at the town from Ridgway, 10 miles to the north. The Uncompahgre River Valley is in the foreground, and the jagged San Juan Mountains loom in the distance, with Ouray just visible through a V-shaped gap. Ouray nestles at 7,792 feet in a mountain park surrounded by the sheer walls of 13,000-foot peaks, notably White Mouse Mountain (13,493 feet) on the west, Hayden Mountain (13,100) on the south and Cascade Mountain (12,100) on the northwest. The Uncompahgre River gave early prospectors one of their few passageways through the rugged San Juans. Originally, however, they came in the other direction, north out of Silverton after silver was found there, and across the route followed later by the “Million Dollar Highway,” as U.S. 550 is known, until they dropped abruptly into Ouray. Ouray is on the northeastern corner of the San Juans, which many regard as Colorado’s most picturesque mountains. It has been a tourist attraction for more than 100 years, long before its neighbor Telluride. The two towns are separated by just nine miles across the mountains, but the trip takes a 50-mile, one-hour drive around the mountains on paved roads year-round or 17-mile, two-hour excursion in a four-wheel-drive vehicle over Imogene Pass (13,114 feet) in the summer (closed in the winter). Ouray began drawing tourists with the Denver & Rio Grande Railroad’s “Around the Circle” tour that started in Denver and ran in a 1,000-mile circle through the Western Slope starting in 1891. A popular option took tourists up from Durango to Silverton, where they caught the Silverton Railroad north to a spot six miles south of Ouray. The final leg into Ouray was covered by stagecoach along the route where Colorado eventually built the “Million Dollar Highway” in the 1930s. The circle trips resumed by train, heading north from Ouray to Ridgeway and Montrose and back to Denver. The circle route was discontinued in 1952, but Ouray had established itself as a tourist destination by then, featuring its historic buildings, Box Canyon Falls and Hot Springs Pool, as well as a rapidly expanding role as a starting point for four-wheel-drive trips into the San Juan Mountains, using roads originally built for the area’s mines. In 1986, Bill Fries was elected mayor of Ouray, a position he held for six years. Fries recorded the 1976 hit song “Convoy” under the name “C.W. McCall.” The Ouray County Courthouse also was used for courtroom scenes in the 1969 movie “True Grit,” starring John Wayne, Kim Darby, and Glen Campbell. County: Ouray (Ouray is county seat). Altitude: 7,792 feet above sea lavel.